Have you ever experienced a phenomenon where a number of seemingly unrelated chunks of time and events conspire to fall together in place, like pieces of a jigsaw puzzle? Sort of like standing too close to a heavily pixelated image and then all at once becoming aware of an awesome picture upon viewing it from the correct distance and perspective. So it was with the story of how horses entered my life and how important a role they ended up playing in it. 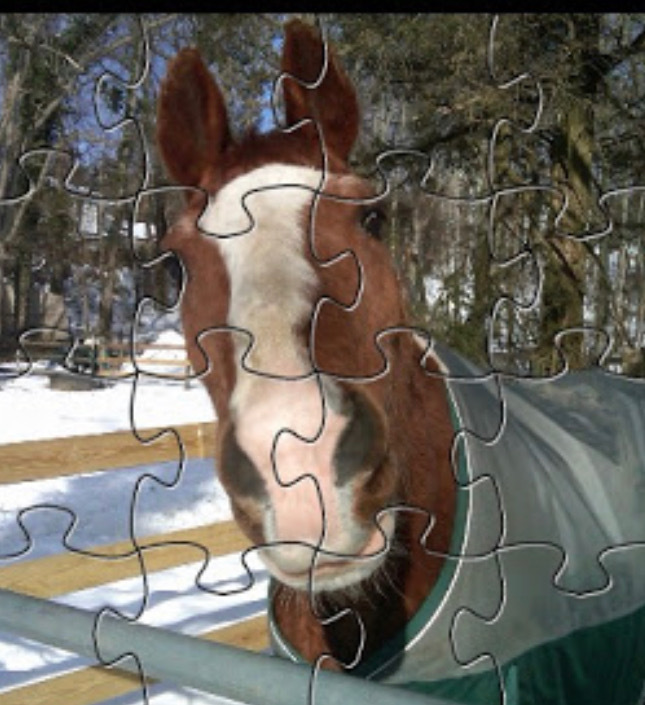 Buddy, the first horse I owned, helped me put all the pieces of the puzzle back together. Photo courtesy of the author. My life and career had been seemingly progressing pretty well when I was in my thirties. I was married to Mary, who was pretty, hardworking, fun and supportive. We bought a house in a neat, beachy community on the north shore of Long Island, had good jobs, travelled and had a bunch of cool stuff. As a self-employed construction trade contractor, I liked to work hard and I liked to play hard and the latter usually included alcohol. It started out innocuously enough. Drinking was a way to put the worries of business and the responsibilities of being an adult on hold for periods of time in order to let go and have some fun. And…it worked! For most people, that’s as far as it goes; perhaps an occasional overindulgence at a social event, or a regret from something uttered at the office holiday party, but nothing to elicit serious concern. But some of us seem to be wired differently. For some of us, drinking progresses to the point where it no longer facilitates and enhances fun activities… it becomes the activity, and when all illusions of control have vanished, we might surround ourselves with like-minded people and create a new sort of normal: one where frequent overindulgence is neither frowned upon nor regaled, it is simply accepted. That is exactly where I found myself at around age forty. The lifestyle was beginning to take its toll, and some incidents shined a light on the problem I had no choice but to come face-to-face with. I had spent many years trying different methods to drink like a normal person, all to no avail. It was confusing, because I was quite successful in dealing with other life problems. The solution to this one, though, remained elusive; the problem was my insistence on finding a way to manage something that to my body, was unmanageable. The answer was a simple one, but not easy: just like someone with an allergy to, say, shellfish, the logical solution would be to avoid it entirely. That proved much easier said than done, of course, because at a certain point the dependence on alcohol affects us on a physical, mental and spiritual level. When something that has become such a big part of life is removed, something has to take its place. It can be a bad thing or a good thing, but that void will be filled. For me, after finding the help to put me back on a healthy path, that something ended up being horses. On a day like any other, a few years into my newly sober lifestyle, my phone rang. On the other end was a well-known Long Island Hunter/Jumper trainer (a fact completely lost on me at the time, never having been on a horse) who had a barn rewiring project for me. I took the job and found myself utterly fascinated with the horses, horse sports and horse people. During my drinking years, I never really found out what made me tick, what I liked, what I was drawn to, where my passions lied. I engaged in hobbies and pursuits that I perceived were cool, or made me look cool, whether or not I was well suited to them. If that ever made me uncomfortable, the alcohol was there to smooth over the feelings. In my world, horses were aesthetically pleasing, had a formidable presence, required skill and courage to master and, to someone like me, completely unattainable. Nobody I knew was involved with horses and they didn’t fit my definition of “cool” so I’d never given them a second thought. Then an interesting thing happened: in being around them over a period of time, I found a strong emotional attachment to horses. I loved being near them and I couldn’t wait to learn how to ride. I brought my eight-year-old niece Sam with me and we set out to learn to ride as two green newbies at a barn full of mostly very experienced riders. 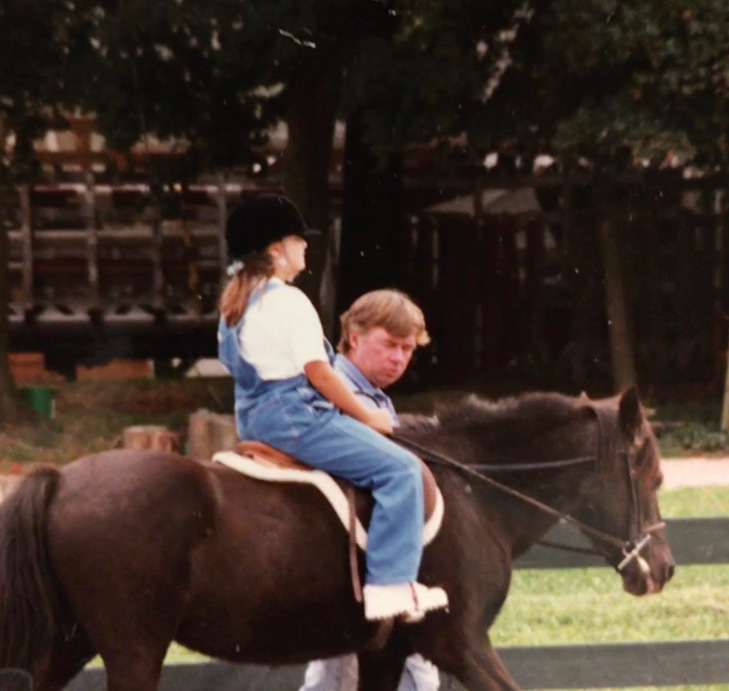 Samantha at age 8 at one of her first rides on a pony named Lucky. Photo courtesy of the author. Very clumsily at first, I pursued my new riding career with a passion that quickly earned me some credibility in the ring, not due to accomplishments, aptitude or ability but by sheer dedication alone. 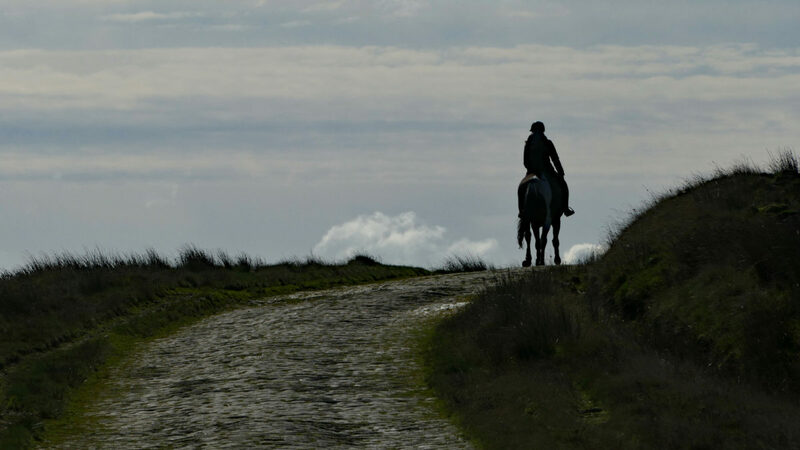 In the process of learning the technical aspects of riding, I found myself the recipient of a totally unexpected gift: the physical manifestations of my drinking had not yet caused any permanent damage and were pretty much addressed by the act of stopping alone. The mental aspects required a little more work, which I addressed by learning as much as I could about alcoholism and allowing myself to be put into a position to be supported and to support others. It was the third component, the spiritual one, to which a solution seemed elusive. This was a soul sickness. One borne of the realization of the extent to which damage had been done, and the denial that had clouded my judgment for so long. It was toward that third, spiritual facet that horses began to fill the hole in my soul that alcohol never could. They held the keys to a new freedom and a new happiness. So, stepping back once again from that fragmented mosaic, I could now see that an awesome plan had been laid out for me, and I had been in the right place at the right time with the willingness to follow it. Spiritual healing is important because guilt and remorse can paralyze our relationships with people. Horses, however, do not care about our past, nor do they care about our worries about the future. They live in the now, and we learn, if we are motivated enough, to live in their world and on their terms. It is from the “now” that we commence to heal, not from any point in the past or future, and a horse can be an ideal partner in the healing process. We learn to be honest because horses respond only to who we truly are and not to the person we pretend to be or think they need us to be. To be accepted simply for who we are creates a feeling of belonging and of having a place in the universe. It is an experience that I might have easily missed had my path not led me where it did. The author’s first mount, “Circus.” He in fact did perform for Ringling Bros., later ponied racehorses at Saratoga and in between taught the author to ride. Photo courtesy of the author. That picture and the plan represented by it gained a more crystal clarity in the life events that followed in ensuing years. We became parents to our young niece Sam, who I had brought to my first riding lesson with me, after her mother died at a young age. 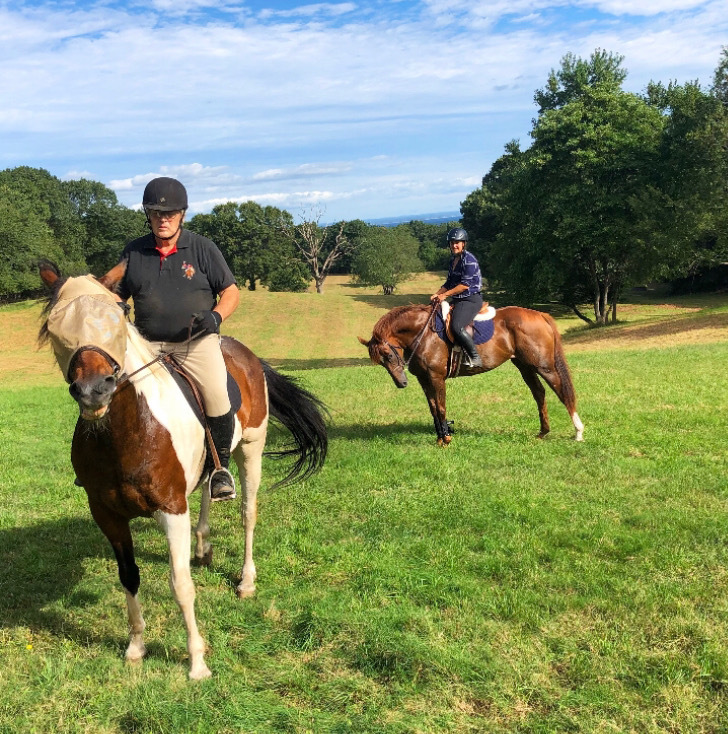 By that time our involvement with horses had increased to the point where we had our own small farm, and our horses were the catalyst that helped the relationship between middle-aged, first-time parents and a young girl who had her life turned upside down. A regular program of lessons and training led to competitions with Sam enjoying many successes in the jumper ring with her Arabian mare, Bella. Sam and Bella attended a horsey college in the Midwest and both returned home having grown in their knowledge, abilities and character. The author, foreground, on DannyBoy and Samantha on her self-trained OTTB mare, Dr. Quinn. Horses are still the catalyst which keep us a close family. Photo courtesy of the author. 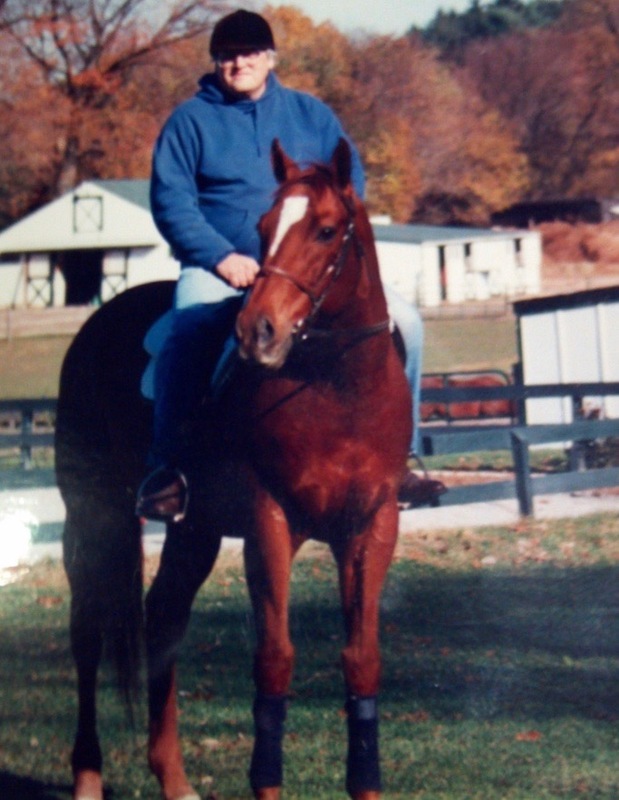 As an empty nester, I stepped up my own training program and ultimately entered the show ring with my APHA gelding DannyBoy, having a few reasonably successful seasons in the eventing field and the jumper ring. Sam is now herself a skilled and empathetic riding instructor and mother to young Daniel, our beautiful grandson who is yet another source of joy. He is being raised on our farm with dogs, horses and love. It was, and is, a beautiful plan, which was invisible until my eyes had become clear enough to see and follow it. And it’s not finished yet. The key to happiness, I’ve found, is not creating a constant flow of stimulation and excitement like I once thought it was. The key, for me, is having something to do, something to love, and something to hope for. Horses have provided, and led me to, all three.